In my previous life, I owned a five litre slow cooker which had initially set me back about £70.00. It was, by far, one of my most loved pieces of kitchen equipment and I used it to excess, especially during Autumn and Winter. Unfortunately, when my husband and I separated back in July, he managed to blag full custody of the slow cooker. I had absolutely no choice but to replace it (not owning one was not an option), but without funds, a repurchase was impossible. Please welcome the £13.99 slow cooker by Cookworks, available from Argos here and modelled beautifully by my kitchen. This slow cooker does only have a 3.5L capacity, but I now have one less adult mouth to feed on a regular basis, and a 3.5L slow cooker is still large enough to cook a whole chicken. I’ll be honest, at first I was very sceptical about the quality of this machine when pitched against my previous, more expensive model. It’s worth noting that the Cookworks 3.5L slow cooker features a “Keep Warm” setting, which is important. This ensures that once your meal has finished cooking, the slow cooker will keep your food temperate and ready to serve until you’re ready. I wouldn’t buy a slow cooker without a “Keep Warm” setting - and they are out there. However - what this slow cooker doesn't possess is a digital timer, and for someone with either a busy lifestyle or a lack of organisation - this could be an issue. With my previous slow cooker, I could set my meal to cook for eight hours, and forget about it, go to work, go out with my family, or go back to bed. Once that eight hours was up, the timer would ensure that the slow cooker automatically went from a cooking function to the "Keep Warm" setting, without interference. Not so with the Cookworks model. 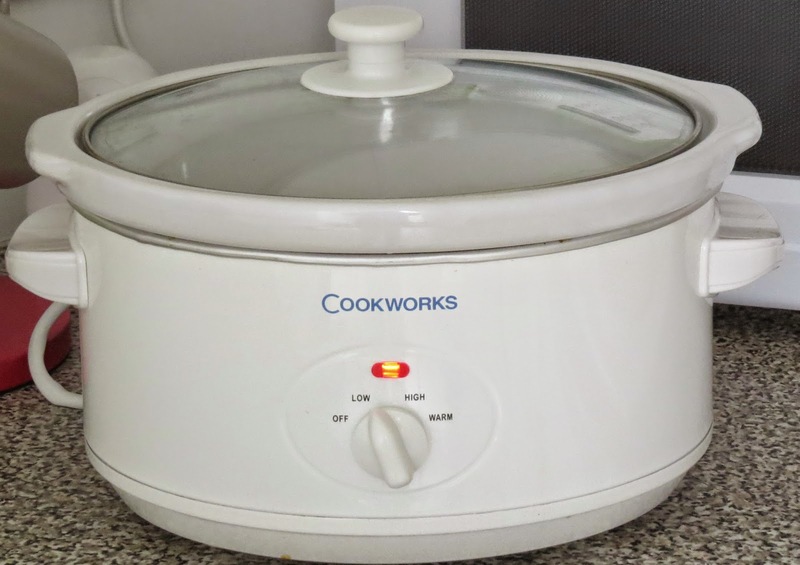 If you don't switch off the cooking function your meal will keep on cooking and whilst it's very difficult to overcook anything in a slow cooker, without a timer, it is certainly possible! The ceramic dish is dishwasher friendly. The glass lid allows you to keep an eye on your meal if you feel the need. Three heat settings (my more expensive model had only two). The obvious downer (for me) is the white plastic finish, but that’s a personal preference issue, and it does live in the cupboard when not in use. The most important thing really, of course, is the performance. Drum roll… this performs at exactly the same level as my £70.00 slow cooker, it does the same thing, for a fraction of the price. It’s totally worth the non-investment and for heaven’s sake, when you can pick this up with the spare pound coins left over from a couple of week’s Costa-Drive-Thru’s, don’t go and buy yourself an expensive slow cooker which fundamentally does the exact same thing. The lack of a timer could present a serious problem for some cooks, and there are affordable models with timers on the market. For me, the lack of a digital timer is an inconvenience, but one which I work around and have quickly gotten used to. The only counter argument here could be longevity. I bought my £70.00 slow cooker in 2012, and as you would expect, it’s still going strong (although I put the lid in the oven with the ceramic dish and melted the plastic handle off!). I’ve only recently spent a whopping £13.99 on the Cookworks model and so I can’t say how long it will last. It certainly wouldn’t represent such great value for money if it conked out next week. However, I have been doing my research, and as far as I can see, the Internet offers no significant tales of woe from previous buyers regarding a short life span on these products, so I have no reason to believe that I won’t get my money’s worth. If you’re looking for some slow cooker inspiration, why not check out my “Slow Cooker Recipes” board on Pinterest? You’ll find it here. All of my pinned recipes stick to my Clean Eating ethos (or where I’d make cleaner substitutions, you’ll see my notes!) and I try to find interesting recipes that I think fellow clean eater’s will find exciting. If you’ve got your own favourite slow cooker recipes I’d love to hear about them; leave a comment below or tag me @ashlawrencerye in your foodie photos on Twitter or Instagram.